Anthuriums are tropical foliage plants often grown indoors. Desirable for their large, colorful spathes (modified leaves), these perennials are popular with home gardeners who want to add a splash of the tropics to their interior or outdoor landscape. There are over 800 species of Anthurium, all native to tropical America, according to University of Florida Extension. Most of these species have many cultivars, making this group one of the largest in the Araceae genus. 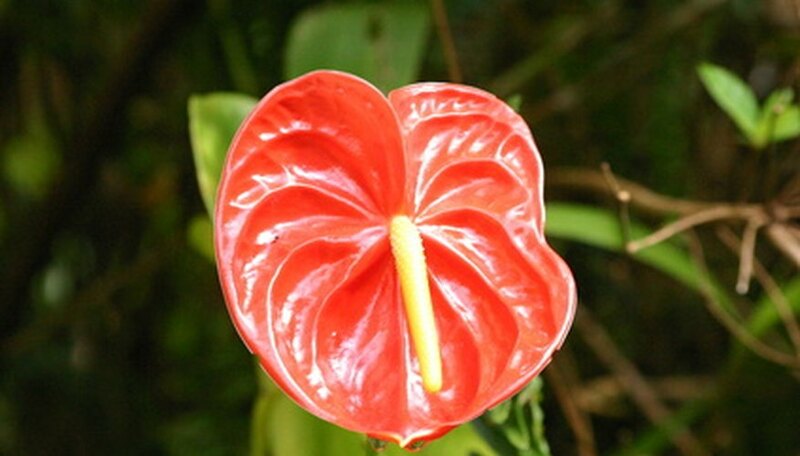 The flamingo flower species of Anthurium features large, heart-shaped, bright red spathes with long, white centers that are sometimes yellow at the tip. They are often sold in bouquets, as they last a long time after being cut. The spathes are very glossy. Bird's nest anthuriums are grown primarily for their huge, stiff, textured leaves. The leaves can be as large as 3 feet. The flowers are long, slender and lavender in color. The margins of the leaves are ruffled and highly decorative. 'Hokuloa' is a cultivar of A. andraeanum. Instead of glossy red spathes, however, this plant has very bright, white spathes, making it highly desirable for use in weddings and other formal events. The flower is a very pale yellow that contrasts nicely with the true white color of the surrounding spathes. 'Bubble Gum' is another cultivar of A. andraeanum, and as its name implies, it features both pale pink spathes and a pink center flower. The leaves are a muted green in color, giving the whole plant a pastel appearance. 'Purple Plum' is a cultivar that it features true purple spathes. The flowers and even the stalks are also purple. The deep purple color is contrasted by rich green leaves, making this anthurium a show-stopper and highly desirable for tropical home gardeners who want a conversation piece.